Kimchi jjigae is a variety of jjigae or stew-like Korean dish made with kimchi and other ingredients such as scallions, onions, diced tofu, pork, and seafood, although pork and seafood are generally not used in the same recipe. 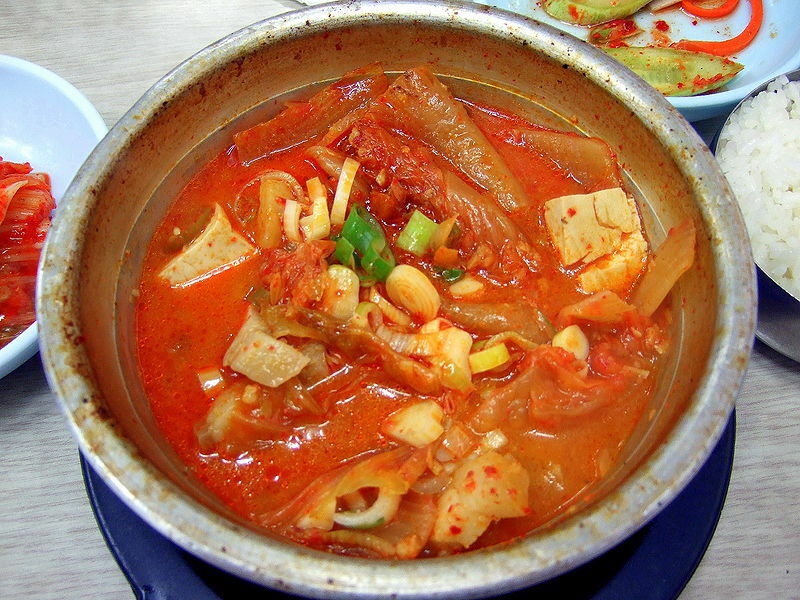 Kimchi jjigae is often cooked in Korean homes using older, more fermented, kimchi, creating a much stronger taste and containing higher amounts of "good" bacteria also found in yogurt. The stew is said to be more flavorful if prepared with older kimchi, while fresh kimchi may not bring out a full and rich flavor. Like many other Korean dishes kimchi jjigae is usually eaten communally from the center of the table if more than two people order it. It is accompanied by various banchan (side dishes) and rice. It is usually cooked and served boiling hot in a stone pot.